I got tired of this unused birdfeeder hangin out in my garage. My husband wouldn't let me toss it away sooooo I asked him if I could have it........and, of course I turned it into a hanging succulent garden! 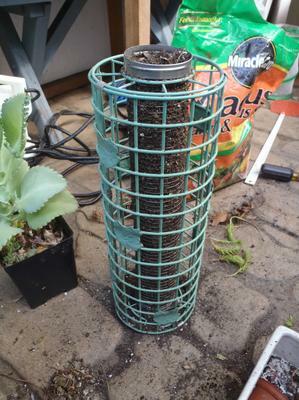 I filled the inside tube with soil and then stuffed the rest with spagnum moss, stuck in some plants and hung it up. It's quite new and I imagine it will fill in and get more attractive in time. About how many semps did you use? Would this last more than one season? I love it! It's beautiful right now, and like you said, when it fills in more it'll be spectacular. Great use of unused items. 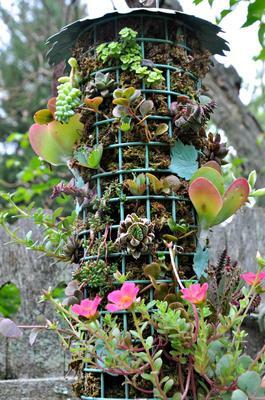 There is no bad way to combine Sedum and other succulents, is there?